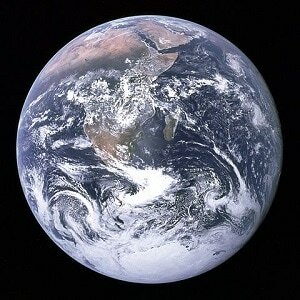 "The Blue Marble": The photograph of Earth taken by the crew of Apollo 17. The question How did humans come to be? is a central concern to any reflective person. It is especially relevant to the religious person, one who believes that God is, that He has made to be all that is not Him, and that He has revealed these facts to man. But for the Christian, who believes that these historical matters have present and indeed future implications for his own soul, the question is serious indeed. It is therefore unsurprising that we who seek to be faithful Christians (especially we “conservative, evangelical” ones) find the question of human origins so fundamentally important, so utterly transfixing. Not only does Scripture teach, in its founding document, that “In the beginning God created the heavens and the earth,” it goes on to tell us how He did so (in six days it turns out), how human beings in particular were fashioned by Him (in His image and from dirt), and how we, no sooner than created to walk with God, tragically broke fellowship with Him. I have thought a good deal about these things. I grew up in a religious community that took the words of Genesis to be literal statements of fact, no different in kind than, “There is a massive statue of a grand lady which stands on an island in New York harbor.” As a young man, I was a devotee of Scientific Creationism, a movement which I now see as utterly discredited. Later, I was influenced by Intelligent Design theory, a perspective that I still think has some intellectual merit. I now stand on the far end of years in graduate school in which I’ve studied a lot of philosophy, a fair amount of theology, and a not insignificant amount of biblical studies. (3) I’ve learned a good deal. I’ve concluded much less. The conceptual and empirical data that must be accounted for are extensive; how best to understand them is often vexed. One thing that I have concluded is that giving simplistic responses to such complicated questions, especially when accompanied by a dogmatic and shrill tone, is shallow, discourteous, and counterproductive. ​So much is riding on the answer. 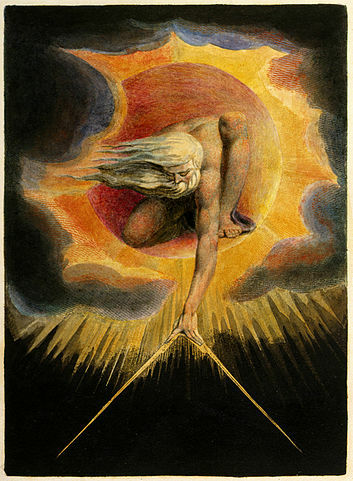 "The Ancient of Days Setting a Compass to the Earth" by William Blake. Sometimes people argue over things about which there just is no such thing as the truth of the matter: for example, what color the living room drapes should be or whether Bach or Mozart is the greatest composer ever. Opinions can be given; reasons can be adduced. Some putative answers are better than others: If you’re wanting your drapes to fall within the same color scheme as the rest of the living room, then it’s an objective question whether a proposed color does so fit. But there are many colors within such a scheme. And why adopt that scheme in the first place? Drapes are (thankfully) largely a matter of personal preference. The case of Bach and Mozart is similar yet different. I take it that the consensus of those who think about such things -- musicologists -- is that Bach and Mozart stand on such a high plateau, sharing company with just a few other such geniuses, that all other composers lie on the dusty plains below. Whether both Bach and Mozart deserve to stand on the plateau is clearly yes. Whether other elite composers belong is also clearly yes. But who those other composers should be (Handel? Haydn? Mendelssohn? Tchaikovsky?) is vexed. Assuming that the group could be fixed, the question of who is the greatest is doubly vexed: indeed, it rings as ill-formed and inappropriate. The following questions are not like the two above: Did all of physical reality arise from a single event that occurred around 13.8 billion years ago? Did the planet we call home coalesce as a distinct “terrestrial ball” a little over 4.5 billion years ago? Did all biological life arise from a single single-celled organism? Do human beings share a lineage with primates? These questions have definite answers. There is a fact of the matter that exists for each of them. After all, if time travel were possible, we could confirm or disconfirm the answers; we would be eyewitnesses. The same is of course true for the correlative questions arising from a literal understanding of Genesis: Did “the heavens and the earth” burst into existence less than 10,000 years ago? Were they “formed and filled” according to the six “day” sequence, as narrated? Were the “days” extremely long (4) or were the days just of the quotidian, twenty-four-hour sort? Were definite biological groupings (“kinds”) established, between which there could be no, as it were, migration? Did God take a bit of dirt, breathe into it, and create the first human? Did He then put that first man to sleep, take a rib from his side, and fashion a partner, a woman, for him? Did an evil being, in the form of a snake, convince man’s partner to eat fruit from a tree, thus bringing evil into the world? Did God later destroy much of what He had just made through a global, catastrophic flood? ​Making these questions, as well as the possibility of actual confirmation / disconfirmation of them, clear and explicit may seem to merely belabor the obvious. Nevertheless, it is crucial, I believe, that Christians think about what they’re really signing up for when they go in for a literal understanding of Genesis. Given that the overwhelming consensus of scientists is that the literalist story is false, how confident is the literalist that, if he were to step into Dr. Who’s Tardis and go back in time, the literalist picture would be confirmed. ​It is crucial that Christians understand what they’re really signing up for when they go in for a literal understanding of Genesis. ​It’s easy to fall back on the traditional view just because it seems safe. But these are questions with yes / no answers, ones having to do with events in time and space. Putting money where mouths are, how much is the literalist truly willing to stake on his answers? If it were to turn out that the literalist picture was false, would he be willing to take the logical step and conclude that the Bible is a lie and that the Gospel is false? Christians often ask each other, in times of crisis, “How big is your God?” So too here: If a time-traveling literalist went to Mesopotamia 10,000 years ago and found no evidence of Eden, Adam and Eve, global floods, or satanic snakes, how “big” would his God be then? Could his conception of God withstand such a shock? Or would he be forced to abandon his faith? I’ve said that the overwhelming consensus of scientists is that the literalist picture of Genesis is false. I want to stress the two words overwhelming and consensus. The answers to the first set of questions -- the ones about the age of the universe and the earth, the evolution of biological life, the descent of man from primates -- are considered by practically all scientists who work on them to be Yes, indeed. (5) People who maintain the literalist view of Genesis need to realize that their understanding is on a par -- as far as mainstream science goes -- with the following beliefs: Vaccinations are dangerous and not necessary. The events on September 11, 2001 were at the instigation of some party other than religious terrorists. A cabal of bankers manipulates the world economy. There is a secret base on the far side of the moon manned by an alien species. Consequently, a literalist about Genesis who says, without further qualification, that “science shows” that some principal feature of the literalist account is true is either ignorant of the facts or disingenuous. What science, as a discipline, shows or otherwise points to is a story of the world quite at odds with the literalist one. This is not to say that there is no evidence from science for divine or supernatural activity in the coming-to-be of the physical world as it is today. But it should be stressed that much of this evidence is, so to speak, negative. (6) That is, it comes from considerations of, say, the infinitesimally small probability that complex biological systems could arise through evolutionary processes or the “irreducible complexity” of the most basic cell. (7) Mainstream scientists see these problems as arising from incompleteness in our current knowledge of the world: either further research will fill these “gaps” or they will remain a mystery to science. Any appeal to the divine or supernatural they consider to be contrary to the spirit of science; they may label (pejoratively) such a strategy as a “God of the gaps” approach. ​The second naturalistic thesis is quite different. Instead of having to do with what exists, it has to do with how we come to know when we do science. (10) In particular, it concerns the appropriate approach to or method of doing science; it is thus called methodological naturalism. The idea is that the only suitable ground for doing science is on the assumption that, for any given question or effect, any putative explanation or cause must be a natural one. When mainstream scientists, as above, discount a proposed, supernaturalist explanation as “God of the gaps,” they are expressing their commitment to methodological naturalism. ​It is important to see that while metaphysical naturalism entails methodological naturalism, the converse is not true. You can believe that the only way to do science is under the assumption that causes and explanations must be natural, while still believing that nature doesn’t exhaust all that exists and allowing that interruptions in nature’s processes -- through miracles -- are possible. You can also adopt methodological naturalism as a guiding principle but when faced by “negative” evidence like that adduced above choose to modify that principle if you believe that evidence warrants a non-natural explanation. ​It is of course impossible for a Christian to be a metaphysical naturalist. We believe that there exist many, many things of which science has never dreamt. Often science popularizers (as well as the unwary) adopt metaphysical naturalism on the sly, arguing (if only implicitly) something like this: Science is the paragon of successful human inquiry; it is thus a broadly reliable means for learning the truth about this world; science has made great progress under the assumption of methodological naturalism; methodological naturalism seems, for all intents and purposes, the same as metaphysical naturalism, therefore, metaphysical naturalism must be true. The problems with this argument should be obvious. ​Though metaphysical naturalism entails methodological naturalism, the converse is not true. Now, metaphysical naturalism is a massive and totalizing thesis; it’s not unlike the following claim: There does not exist somewhere in the universe a set of rubies laid out in a pattern looking exactly like a rabbit. The difficulty in “proving” this is obvious. Philosophically sensitive metaphysical naturalists (unlike the science popularizers above) know that they can’t establish their thesis for certain; yet they are still confident that it’s true due to the following sorts of considerations: It is reasonable to suppose that the natural universe is a closed system, a self-contained whole. Methodological naturalism has proved its worth via the progress of science; it is reasonable to assume that that’s because metaphysical naturalism is true. Arguments for the existence of God, miracles, souls, and other such are (in their view) unsuccessful. Moreover, the burden of proof lies with the non-naturalist to show that such (allegedly) extravagant claims -- that God, miracles, and so forth exist -- are true, not with the naturalist to show they are false. Since the non-naturalist cannot meet that burden, then the reasonable conclusion is that naturalism is true. And so on. ​Assuming that the physical world is a nexus of cause-and-effect is what makes science work. Without methodological naturalism -- at least as a working hypothesis that has been overwhelmingly validated -- science, engineering, and technological innovation would all grind to a halt. In this respect science is no different from other human endeavors: Imagine a mechanic troubleshooting a misfiring engine who thought that there could be mysterious “gaps” in the way engines normally worked. Or an accountant who was willing to assess the value of a company though she knew there were large holes in her knowledge of its inner workings. Or a computer technician who seriously believed in computer “gremlins,” rather than in real faults in hardware or software. And so on. The point is simple: Belief that the world is a causal place is what makes our everyday world go round. Assuming that the physical world is a nexus of cause-and-effect is what makes science work. But there is another reason why we, as Christians, cannot simply jettison methodological naturalism: It’s a theological one. Belief that the world is a richly and amply created place is a core Christian belief. We are neither polytheists like the ancient Greeks who thought that the gods were the sources of physical phenomena. Nor are we animists who think that spirits inhabit rocks and trees and are causally responsible for various events. No, we believe that God made the world and called it good. That He filled it to the bursting with potentialities and powers. True, He both conserves the world and concurs in its operations. But He made the world to operate, by and large, on its own. If methodological naturalism were not true -- again, on the whole, in general, for the most part -- then God would have been a poor Creator. But He is not. Given these considerations on naturalism, how should a Christian respond to the claims of mainstream science? That is, given a particular claim -- e.g., the Appalachian mountains are much older than the Rockies; the distance to Alpha Centauri is 4.37 light-years; increasing the concentration of carbon dioxide in the atmosphere increases the solar energy retained within it -- how should a Christian respond? What is the most appropriate and most faithful attitude she can take vis-à-vis such a claim? ​Clearly if a scientist is urging a position that embraces metaphysical naturalism, the Christian must object. But, as implied earlier, science as science simply cannot speak to the truth or falsity of metaphysical naturalism. Naturalism is a philosophical thesis, not a scientific one. When a scientist urges in “the name of science” that naturalism must be true, he is going beyond the bounds of what he can legitimately say as a scientist. However, if a scientist makes a claim, consistent with the assumption of methodological naturalism, that “thus and so” is true, then it would seem that, by Christian lights, he deserves a fair hearing. The scientist’s evidence may be strong or weak; his claim should be evaluated accordingly. ​This assumes, of course, that the Christian doesn’t have some other, countervailing source of knowledge on the particular topic. But that is just what some Christians believe they possess -- divine knowledge in fact. That is, they -- especially those urging a literalist understanding of Genesis -- think that the Bible makes specific and detailed claims which are scientifically relevant. Inasmuch as they believe that the Bible is inerrant (11) -- by which they mean something like “true on face value, on a plain reading of the text” -- they are compelled to part ways with science, methodological naturalism be darned. To this question of the Bible’s relevance to science (and history) we must now turn. Science as science cannot speak for the truth or falsity of metaphysical naturalism. Metaphysical naturalism is a philosophical thesis, not a scientific one. Jonah being swallowed by The Fish. 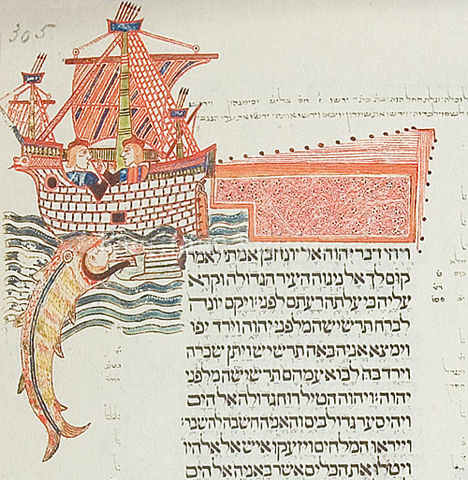 From the Kennicott Bible, 1476. Setting aside whether any of these is even a secondary point of the Scripture, what is its main point? Here is how I understand it: To reveal three sets of facts: ones about God, ones about human beings, and ones about how they are related. Concerning God, that He exists, independent of and distinct from anything else; that He has certain characteristics and acts in certain ways; that His nature is such as to contain a plurality within a unity; and that He is, wonder of wonders, deeply interested in humans. The Bible reveals three sets of facts: ones about God, ones about human beings, and ones about how God and humans are related. Other details than these may emerge and may be warranted by the data of Scripture. But it seems to me that we as Christians should be quite careful in what other facts we add to to these. In the first place, we should be cautious in, as it were, putting words in God’s mouth. What God has said we should follow; what He has not, we should not presume to know. Christians sometimes adopt methods of interpreting the Bible that are great at examining tree bark but lousy at identifying the park in which a tree is actually located. It would be sadly ironic if an obsession with the words of the Bible led them to miss what it’s ultimately trying to say. ​​​In the second place, many devout, sincere, and smart Christians have drawn different conclusions about what these second order details may be: The Eucharist (Lord’s Supper); the necessity of a church hierarchy; the possibility of “super Christians” (saints); the mechanics, so to speak, of how God’s grace is applied to the penitent; what God’s providential oversight of the world actually consists in; the manner in which water ought to be applied to the penitent; the possibility of purgation of sins after death; and so on. These are all examples of second order details that Christians have disagreed on, sometimes so strongly as to come to blows. Christians should be cautious in putting words in God's mouth. What He has said we should follow; what He has not, we should not presume to know. How do these considerations apply to the first chapters of Genesis? Well, their main points are clear enough: We’re supposed to understand that God has made everything; that He thinks what He’s made is good; that humans bear a special relationship to God; and that they’ve broken it. How important are the details of the story? The “days,” the order of the days, the specific acts of creation during the days, Eden, an original pair of humans, a rib, a snake, an angel with a flaming sword, and so forth? I submit: Not that much. Again, if we were able to travel back in time and not find evidence of these things, how much would it matter to our faith? Does our confidence in God and the Gospel depend on these details? I pray not. 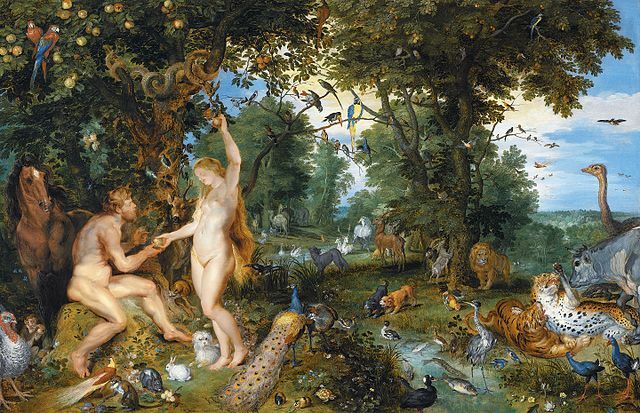 "The Garden of Eden with the Fall of Man" by Jan Brueghel the Elder and Pieter Paul Rubens. The literalist will object: “How can we say that the Bible is God’s Word, and thus true, and yet deny what these chapters clearly say?” Let’s focus on the phrase “clearly say.” So, what does the text clearly say? Stripped to its essentials the literalist position is that the text should be read as if it were no different than an article in a newspaper. That is, the text provides a straightforward reporting of events which is no different in kind than that of a journalist’s recounting of a bank’s being robbed in downtown Atlanta, Georgia. True, some literalists will soften their position by arguing that the “days” of Genesis are supposed to be very long periods of time. What if the Genesis account is not supposed to be a kind of reporting? Take Dante: In the poem he refers to many events and persons contemporaneous with him; he also incorporates many classical, biblical, and liturgical sources. He weaves these things into a masterpiece of a poem which, though not meant to be read literally, is still true: It’s true inasmuch as Dante speaks to timeless truths, ones concerning God, creation, and people. Though Dante incorporates both allegory and metaphor into the poem and though, in some sense, the poem itself is allegorical and metaphorical, to say that it is merely or only an allegory or a metaphor is to completely miss the point. What about Genesis? Many scholars (15) understand it as written in a literary form that was meant to serve as a response to the nations contemporaneous with Israel by testifying to the greatness of Israel’s God over and against the deities of those other nations. We have examples of the creation stories of other ancient nations that parallel that of Genesis. What makes Genesis really amazing is that, whereas these other stories include a pantheon of deities, Genesis concerns just one, single God. That’s what sets it apart, makes it different, from those other narratives. The literalist’s obsession with textual details obscures this grander, richer story. The not-literal-yet-still-true understanding of Genesis I am arguing for here is, I maintain, the one most faithful to the text. It takes nothing away from the grandeur of the underlying story and detracts nothing from the worship due to our God. To import a modern, journalistic mindset into a culture that existed 2,500 years ago is like expecting a 15th century cartographer to conceptualize Google Earth running on a smartphone. 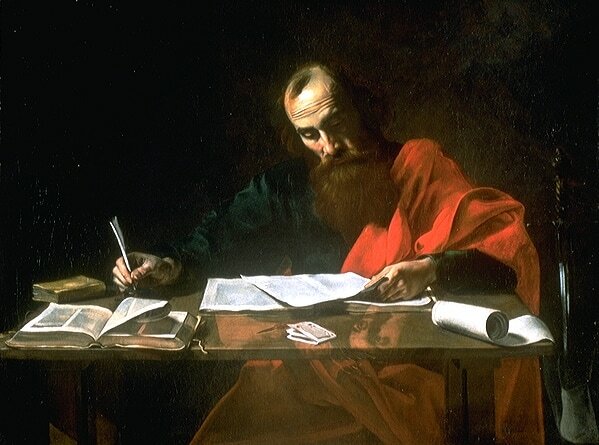 "Saint Paul Writing His Epistles" by Valentin de Boulogne. The final issue here is the biblical / theological one raised by St. Paul, namely, that of Adam as the Original Man and Christ as the New Man, expounded in the text I quoted at the outset. There are at least two concerns: The first has to do with the coherence of the Bible as a whole. If the New Testament quotes an Old Testament text as stating an historical fact, then wouldn’t a “revisionist” understanding of that Old Testament fact (like the one I’m urging here for Genesis) mean that the New Testament is not only stating a falsehood but also contradicting the Old Testament? The second has to do with the theological narrative of Creation, Fall, and Redemption put forth in Paul’s text and which is, to be sure, central to Christian belief. If an original Man didn’t actually exist and hence didn’t actually sin, then doesn’t that rule out Fallenness and thus obviate the need for Redemption? The most plausible reason for why Paul appealed to Adam is the simple fact that he read it in the Torah. On the other hand, Paul was, from the evidence of his writings, a very intelligent, erudite man. His brilliant argumentation in Romans (of which our passage is a part) is only one reason why he is rightly considered a towering figure in the Western tradition. Nevertheless, the most plausible reason for why he appealed to Adam is the simple fact that he read it in the Torah. The Torah contained the Genesis account and like all faithful Jews Paul believed it. He read the Torah, the Torah spoke of Adam, and Paul referred to Adam the way the Torah did. That Paul believed in an Adam like that given in Genesis is not in doubt. What is doubtful is that this whole business about a literal versus a non-literal understanding of Genesis was even a live question to him. The grounds for his belief lay in a simple confidence in what the Torah stated, not in some complicated account of a literal versus non-literal understanding of the text. This is (mostly) a modern preoccupation and though, as intelligent as Paul evidently was, he would have likely understood the terms of the debate, it is, again, doubtful that the question would have ever occurred to him. He would have understood the text the way a modern day literalist does but would have been either unaware of or not interested in any other way to think about it. ​So where does this leave us relative to the text in Romans? I suggest that we understand it as written just as it was: By a first-century man, operating within the epistemic constraints of his day and time, his context and milieu, his training and study, though inspired by God to communicate the essential truths of the Gospel. We should remember that “the word of the Lord” always came (and comes) to a particular person who lived in a particular historical and cultural context. It is both unrealistic and unnecessary to expect that knowledge about facts about science or history should be communicated which are wildly out of place relative to that person’s context. The understanding of Romans I am urging here neutralizes the possibility, raised above, that the Bible doesn’t cohere as a whole, that the Old and New conflict on such a basic issue as the creation of the heavens and the earth. What about the theological issue? That is, that if an original Man didn’t actually exist and hence didn’t actually sin, then Fallenness is ruled out and hence the need for Redemption is obviated? I am aware, given the position I’m defending, that this is a potent theological objection. Paul’s overall account depends upon the First Man’s free choice; it is due to Adam’s disobedience that sin entered the world and death through sin. The end result of my arguments has been to change the problematics... There are no free lunches when it comes to complex problems. 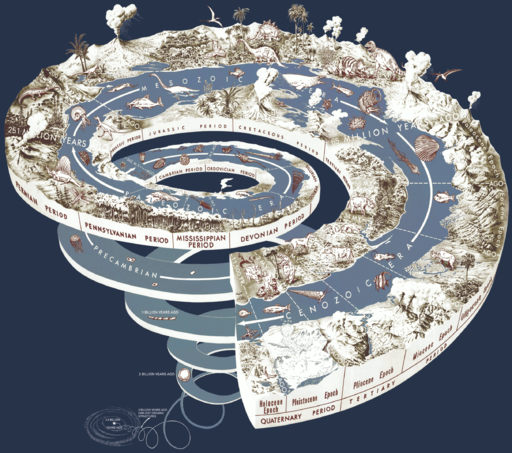 "Geological time spiral" by United States Geological Survey. We can at last turn to an evaluation of the options available to Christians when it comes to origins. One important preliminary, however, concerns what we actually mean, from the perspective of science, when we talk about origins. When people discuss this topic they typically speak in terms of “creation versus evolution.” That is far too crude a designation. (16) For example, the theory of evolution itself says nothing about the coming to be of the universe. Theists who affirm evolutionary theory (theistic evolutionists) nevertheless believe that God made the universe come to be, that He created it. Deep Time -- the idea that the Universe is very, very old -- is another idea lumped under the rubric of “creation versus evolution.” The emergence of the first biological cell; the theory of the common ancestry of all biological organisms; the descent of humans from primates -- all of these are placed under this heading. It is important to recognize that each of these are distinct questions; the scientific evidence bearing on each varies. Thus, the evidence for the Big Bang -- as close an equivalent in physical terms to the theological notion of ex nihilo creation as could be expected -- is very high, while evidence for rival cosmogonies or for the so-called multiverse are highly speculative. (17) The evidence for Deep Time is extraordinarily compelling. The common ancestry of all biological life (or at least large swathes of it), as well as the emergence of humans from primates, are likewise reasonably well-supported. On the other hand, how the earliest cells, the basic building blocks of life, came to be is, as I understand things, still mostly speculative. (18) Moreover, the “negative” evidence I referred to earlier -- vast improbabilities, irreducible complexity, the origin and preservation of the information contained in the genetic code, and other evidence adduced by the Intelligent Design (ID) theorists -- bears consideration. It’s also true that the fossil record is incomplete; it’s not as if there’s a complete story, written in stone, documenting the Darwinian account. Moreover, there are these amazing bursts of activity we find in the fossil record -- the most amazing one being the so-called Cambrian Explosion -- that indicate that Darwinian evolution is not the complete story. There may never be “proof” that the theory is correct but that does not mean that it is reasonable to reject it. Breaking “creation versus evolution” into distinct, standalone theses, like we’ve just done, allows us to accurately assess the options available to a Christian vis-à-vis origins. The qualifier “available to Christians” is of course crucial. A view that posited an eternal past to the Universe (or multiverse) such that the Universe never, as it were, properly came into being (that is, through creation ex nihilo) would not qualify as Christian. (20) Moreover, as the philosopher Alvin Plantinga has pointed out, a view that asserted that life arose through blind chance would not be a Christian one. Our God guides all things; if naturalistic explanations for the origin of life are the most plausible, based on the scientific evidence, then God must have sovereignly guided those processes. 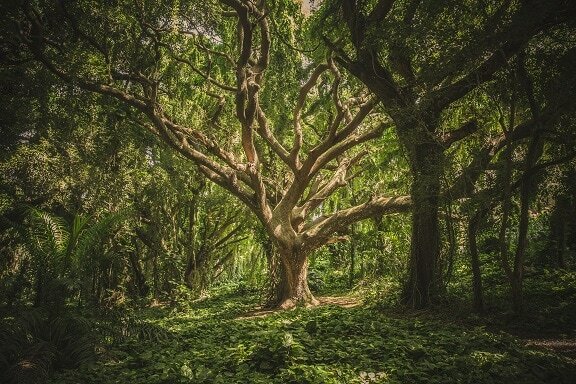 When it comes to the origins of life, there are, broadly speaking, three possibilities for a Christian: (21) You can adopt a literalist interpretation of Genesis, coupled with a literalist understanding of what the Bible has to say about the age of the earth. (From the Bible’s genealogies you arrive at a date for creation of around 10,000 years ago.) This view is usually called Young Earth Creationism (YEC). So-called Scientific Creationists attempt to provide bona fide scientific arguments in support of YEC. (22) At the other end of the spectrum, you can adopt the mainstream scientific consensus -- subject to the theological qualifications mentioned above. This is Theistic Evolution (TE). (23) Or you can plump for a sort of via media between the two. For my part, I believe that Young Earth Creationism is (not to put too fine a point on it) really quite terrible. As I’ve argued above, it relies on an interpretation of Scripture that is completely wrongheaded. Its unwillingness to seriously engage methodological naturalism leads to both bad science and a doctrine of creation that essentially emasculates the powers and potentialities of the natural world. Its attempt to provide a scientific basis for its claims -- via Scientific Creationism -- is mostly pseudoscience. (24) The result is a thesis that is just about as wrong as it could be: theologically, biblically, and scientifically. A good example of its intellectual bankruptcy is the claim (made by many YECs) that all the evidence for Deep Time was, as it were, built into God’s “presto!” creation of the Universe 10,000 years ago, that the apparent age of the Universe is just that -- apparent. Beyond being desperately ad hoc, this move essentially attributes deception (or at the very least misdirection) to the Creator. Theistic Evolution is the most comfortable option of the three -- at least for the Christian who has great respect and confidence in mainstream science. Assuming he can withstand the “slings and arrows” of outraged fellow Christians, the position affords him intellectual respectability within the dominant secular culture. At a dinner with fellow academics he can comfortably agree with “the assured results” of science and not have to stick his neck out vis-à-vis his faith. This isn’t of course an argument against TE; it’s more a warning against the subtle seduction of intellectual respectability. Again, theistic evolutionists who do not explicitly state their commitment to God’s direction of the evolutionary process cannot plausibly claim that their view is a Christian one: There is a very fine line between theistic evolution and deism. The third way seeks to plot a course between these two extremes, between Scylla and Charybdis, between the devil and the deep blue sea. For that reason it is liable to attack from all sides: Biblical literalists find it unChristian; mainstream science considers it pseudoscience. Progressive (or Old Earth) Creationists (PC) accept Deep Time. However, though they accept the reality of small-scale evolution (say, within a species), they reject the possibility of the evolution of one distinct biological group from another. (25) Consequently, they also reject the grand evolutionary narrative that all biological life derives from a common ancestor. Progressive Creationists see the large gaps in the geological / fossil record, followed by the brilliant bursts of new organisms, as evidence that God created all life in a series of distinct steps. Needless to say, mainstream science rejects this account. The relatively recent Intelligent Design movement likewise falls into this third group. Though ID seeks to remain neutral as to who the actual Designer is, the God of classical theism is really the only viable candidate. To my mind, the claims and arguments of ID make a lot of sense. Mainstream scientists mostly loathe it. For that reason it is liable to attack from all sides. For my own part, at this point in my intellectual journey I fall somewhere in the third group -- though I’m neither an out-and-out supporter of Progressive Creationism nor of Intelligent Design. (26) When mainstream scientists reject a putative non-natural explanation for the origins of life just because it is non-natural (as they often do), then they are putting more weight on the idea of methodological naturalism than it can logically bear. They are drifting, wittingly or not, into a de facto metaphysical naturalism. Who’s to say, prima facie, that there’s not evidence of non-natural causes in the physical world? Our state of knowledge about the physical world is still quite incomplete. Moreover, the prospects of our ever having absolutely complete knowledge of the origins of life are remote. It seems to me that intelligent, sincere people will always be able to raise reasonable doubts about the grand evolutionary story. Moreover, as a Christian I believe that I have other sources of knowledge about the physical world than just that of science. Though I reject the literalist account of Genesis because it’s terrible theology, hermeneutics, and science, I still know that God works in the world, that He created and sustains it, that He works miracles, and so on. If mainstream science rejects these other sources out-of-hand, then so be it. My only responsibility as a seeker of truth is to work hard to improve what I can justifiably say I know and to follow the evidence where it leads. I have a deep and abiding respect (bordering on reverence) for the methods and conclusions of science. I think its claims are, generally, prima facie justified -- that is, that the burden of proof is on the doubter. But science is, again, not the only source of knowledge available to me. I have also knowledge arising from theology and philosophy. It falls to the latter, especially, to set the limits within which science can speak. More’s the pity, then, that most scientists are philosophically ignorant. 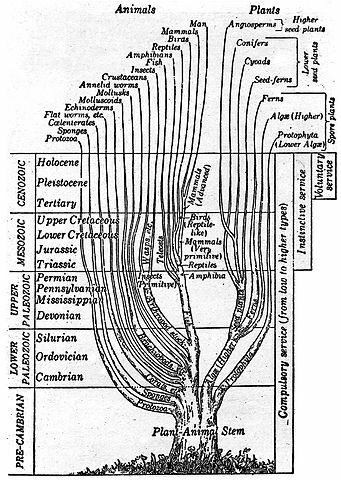 "Tree, plant and animal stem" from Scientific American, August-September 1930. I believe the following statement wholeheartedly: All truth is God’s truth. If science or biblical studies or history or whatever other discipline presents evidence that a certain claim is true, then it is incumbent on me as a follower of Truth to truly grapple with that evidence. Blanket claims by some Christians that so-called secular knowledge is inherently faulty, due to its originating from allegedly anti-theistic or anti-Christian presuppositions, amount to little more than hand-waving. In my experience, most professionals in these disciplines have no particular ax to grind. It is true that every person brings some antecedent presuppositions to their work -- Christians no less than anyone else. But most people are able to set aside their religious or philosophical preconceptions long enough to do their jobs honestly. Christians who are habitually dismissive of science because of its allegedly defective presuppositions adopt a mindset not unlike that of conspiracy theorists. This is not to say that Christians shouldn’t be discerning -- of course they should be. They should always be on guard against metaphysical naturalism, which is so easily conflated with methodological naturalism. To do so they should heed another favorite statement: The mark of a mature mind is the ability to make distinctions. 9 year WMAP image of background cosmic radiation (2012). (1) My thinking on this topic has been influenced by various books, articles, and lectures, too many to recount. (The bibliography on this topic is vast, much of it quite useless.) Nothing I’ve written here is, conceptually-speaking, particularly original with me, though the form and argumentation I employ is of course my own. I have found the book Three Views on Creation and Evolution from the Zondervan Counterpoints Series to be helpful in understanding the options available to a Christian. I’ve also found articles by the philosopher Alvin Plantinga to be helpful in thinking, philosophically, about the appropriate relation between science and faith, particularly as touching this topic. This essay was originally published on 3/22/14. Minor revisions were made when published on the website on 5/13/17. Over these three years, my views have remained substantially the same -- though with a few new nuances: As in so many other things, the writings of N.T. Wright have profoundly influenced my views on St. Paul and the classic (i.e., that of the Reformers) statements on soteriology. I am referring to Wright's expositions on the so-called New Perspective on Paul. Space does not permit me -- another essay would be warranted -- to consider this here. Suffice it to say that I am even less concerned, now, that a historical Adam is required to make the doctrine of atonement work. To, as it were, get the doctrinal sums to add up correctly. I am also -- again, I'm deeply indebted to Wright -- much less exercised nowadays about the doctrine of Biblical inerrancy. I now believe that that notion -- at least as it's put forward by most conservative evangelicals -- is both inappropriate to, and thus unhelpful in, understanding what the Bible has to say. I think it has much greater affinity with Enlightenment positivist epistemology than it does with a careful, thoughtful, and sympathetic comprehension of Holy Writ. ​(3) Though I am not a scientist, my undergraduate education and some subsequent professional experience were in engineering -- the, as it were, younger sibling of science. My graduate work in philosophy required study of the philosophy of science. As a lay person, I’ve read a goodly amount on science. I also, currently, work in a supporting role to real scientists: I build places for them to do their research. The conjunction of the above gives me, I think, a knowledge and appreciation of the methods and results of science at least as high as that of the average, reasonably well-educated person. One thing I have concluded is that actual study and practice of science or related disciplines (such as engineering) would do a world of good to “CreVolution” dogmatists. (4) As the so-called "day-age theory" has it. (5) I will not consider or debate here the evidence for what mainstream science says about origins. It would take me too far afield and is in any event beside the point of this essay. There are many resources available for study. The BioLogos Foundation (www.biologos.org) has much excellent material and is written from a Christian perspective. (6) Positive evidence -- that is, data coming from, say, the fossil record -- adduced by literalists can almost always be fit within the general scheme of mainstream science to produce a global theoretical picture that is more satisfactory than if that same evidence were integrated into a putative literalist, global theoretical picture. (8) Use of the word “supernatural” inevitably brings up thoughts of ghosts and such. If ghosts or “spirits” exist these certainly count as supernatural. However, I hope it is clear that my primary concern here is God and the divine, both the possibility of His existence and of His acting within nature (from the outside in, so to speak) through miracles. The Latin supra (“above, beyond”) conveys my intent well. It is unfortunate that “super” has become so trivialized in our language. The old and traditional distinction between nature and supernature is my target here. (9) The view is also called ontological, philosophical, and scientific naturalism. These all amount to essentially the same view. Materialism or scientific materialism are other names for essentially the same thesis. (10) It thus has to do with epistemology. (11) Christians can mean different things when they speak of the inerrancy of Scripture. Here, I am not arguing for or against any particular understanding of it. The gloss I give here -- “true on face value, on a plain reading of the text” -- captures how many conservative, evangelical Christians think about inerrancy. It is sufficient for my present purposes. ​(12) For example, the theonomists of the so-called Christian Reconstructionist movement who maintain that the Mosaic law should be the basis of modern civil law. (13) Thus, e.g., the view that St. Paul in Romans chapter 7 is providing a bona fide psychology of how humans respond to temptation; or the idea that the so-called spiritual gifts are intended to be an exhaustive list of human personality types. (14) There are other intentions in Genesis; in particular it provides a founding creation story for ancient Israel. But I maintain that the main point is to testify to the God of Israel’s greatness over and against the deities of the nations surrounding Israel. (15) I say “many” but most is likely more accurate. I’m not aware of a poll of people who study these things for a living. The literalist can appeal to all manner of scholars -- some bona fide, others not so much -- that argue for a literal interpretation. But I think that many Christian scholars, even good ones, have an extremely difficult time separating their theological commitments from an objective appraisal of the intent of Genesis. As to “secular” scholars, literalists tend to reject their opinion out of hand simply because they aren’t Christians -- which is unfair. (16) Plantinga, in one of his articles, lays out possible sub-theses under the overall rubric of “creation versus evolution,” that is to say, what people might mean when they use this imprecise designation. His discussion is the ultimate source for what I’m writing in this paragraph and the following one. (17) Indeed, such ideas (e.g., the multiverse) smack of desperation. (19) It is in any event an open philosophical question (at least for me) as to how much evidence, in terms of physical facts that can only be explained by the hypothesis that God exists, it is necessary to possess before we can say we have a robust argument, originating from facts about the physical world, that God exists. Moreover, there are other sorts of arguments for God’s existence (from morality, from metaphysics, from direct experience of God, and so on) besides the ones originating in evidence from the physical world. These may ultimately be more compelling. One of the characters in John Green’s novel The Fault in Our Stars says that “I believe the universe wants to be noticed. I think the universe is improbably biased toward consciousness, that it rewards intelligence in part because the universe enjoys its elegance being observed.” It seems to me that only people who can recognize and appreciate this fact, a fact that is ultimately one about beauty, will ever see God’s presence in the universe. A person who cannot or will not, will never see God, no matter how strong the evidence. (20) Or so I and most theologians would maintain. Philosophically, it is possible to argue that as long as the Universe is contingent -- that is, not a necessarily existing thing -- and is dependent, ontologically-speaking, on a necessary Being, then that is enough to qualify as the Christian view of creation ex nihilo. I think that that’s a good argument for the existence of God. It doesn’t seem a good argument for the Christian (or Jewish) God. ​(21) There a number of variants that I’m ignoring for clarity here, including, “gap theory creationism” and “day-age creationism.” The series on Creationism in Wikipedia does a good job laying out all the variants of creationist views. (22) The Institute for Creation Research (www.icr.org), particularly through the works of Henry Morris, did the most to promote YEC and Scientific Creationism in the last century. I take it that Ken Ham from Answers in Genesis (www.answersingenesis.org) is the main flag bearer for the movement now. (23) TE is sometimes also called evolutionary creationism, though the word “creationism” is a fairly toxic one among scientists. (24) Again, I’m not going to present the evidence for mainstream science relative to the age of the earth and evolution. There are plenty of resources online. Biologos.org is probably the best. (25) These two kinds of evolution are known as micro- versus macro- evolution, respectively. It is unclear to me how far micro-evolutionists are willing to extend the scope of evolution. Is it just within a species? Can there be some minor “jumps” between species -- as long as the jump is sufficiently short? Questions for a different day. (26) In fact, I would say that I tend toward the theistic evolution “side” of this middle way. This essay was originally published on 3/22/14. Minor revisions were made on 5/13/17.